Michael Wayland covers General Motors and labor relations for Automotive News. Attention-grabbing design meets customer-focused technologies in the 2019 Blazer. Available this spring, it will slot between the Equinox and Traverse. The five-passenger Blazer bristles with innovations such as hitch guidance and hitch view, electronic-locking glovebox, automatic heated steering wheel and automatic heated and ventilated front seats. 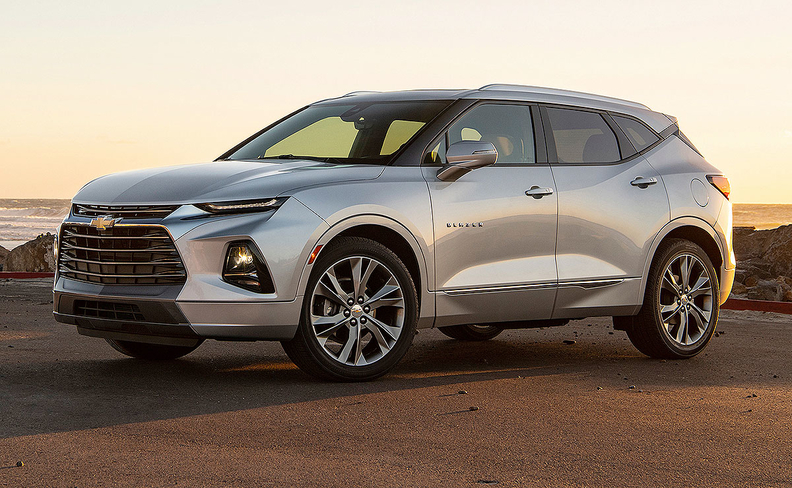 SAN DIEGO -- The 2019 Chevrolet Blazer isn't for those looking to relive adventures in their K5 Blazer or wanting an alternative to the Jeep Wrangler. It's for anyone looking to move from a car into a crossover without sacrificing driving characteristics or for empty nesters seeking to downsize from a three-row crossover or SUV with a V-6 or V-8 engine. The vehicle is more Camaro than SUV, despite the Blazer name. And it's definitely much less Equinox than expected. The resurrected SUV-turned-crossover handles well -- particularly the RS model with twin-clutch, all-wheel drive and a steering system similar to that of the Camaro -- and is extremely sporty compared with most competitors in the segment. Part of that is thanks to the available 3.6-litre V-6, making 308 hp and 270 pound-feet of torque, combined with the nine-speed automatic. The engine isn't as powerful as that of the recently launched Ford Edge ST -- a main competitor -- but it gets the job done and General Motors engineers made sure the vehicle's Sport mode feels different from the standard driving mode. A 2.5-litre four-cylinder Ecotec engine that makes 193 hp and 188 pound-feet of torque, combined with a nine-speed automatic transmission, is standard. The vehicle's design also forgoes rugged, trucklike features in exchange for a more sports-car-like exterior and sleek, tech-savvy interior. The cabin features several Camaro design elements, including circular air vents, a sleek screen and several more upscale features. Whether the Blazer can draw buyers from their Edge, Honda Pilot or Jeep Grand Cherokee (a goal of Chevy's marketers) will likely depend on whether the advertising -- starting around April 1 -- can cut through the noise around the vehicle. The Blazer has become the newest political football from GM with the company's decision to import it from Mexico. Canadian union Unifor has called for a boycott of the Blazer and all Mexican-made vehicles, while the UAW is urging members and their families not to buy it. One thing the UAW and Unifor have overlooked: The Blazer has more U.S./Canadian parts than other vehicles the unions produce in U.S. and Canadian plants today. The Blazer is made with 54 per cent U.S. and Canadian parts, according to window stickers on dealer lots. Just 22 per cent of its content is from Mexico -- in line with the Michigan-made Chevy Traverse crossover and less than the Chevy Trax made in South Korea and Equinox made in Canada. Another thing to note is GM decided to build the Blazer at its Ramos Arizpe plant after ending production of the Cadillac SRX there and assembling its replacement, the XT5, in Spring Hill, Tenn.
Pricing of the Blazer also could be a hindrance. While the vehicle starts at $37,095, including shipping.